Highly instructive EuCNC 2017 edition & spectrum workshop in Brussels! 5G PPP and 5G IA thus played a prominent role at this year’s EuCNC conference. 5G PPP Projects were involved in the event with many synergic initiatives, including 13 booths where demos were showcased to 650 attendees. For those who could not attend, some videos (including Terje Tjelta’s presentation on spectrum, Markus Dillinger’s presentation on connected cars and Jean-Pierre Bienaimé’s presentation at the closing session) are available here. More videos, including an interview with Bernard Barani of the EC, are available on the EuCNC 2017 YouTube channel here. ➧8 SMEs projects showcased their demos in a specific booth. ➧Many workshops were organised. Also refer to the final programme here. –CHARISMA, SESAME, COHERENT, VirtuWind, 5G-NORMA, 5GEx, SPEED-5G,SELFNET and mmMAGIC projects organised the “Workshop on Business Models and techno-economic analysis for 5G networks”. –5G-CROSSHAUL and 5G-XHAUL co-organised (with iCIRRUS) a Workshop on “New XHaul solutions for the 5G transport challenge”. –The Software Network Working Group (SONATA, 5GEx, 5G-CROSSHAUL,SUPERFLUIDITY, Charisma, SESAME, SELFNET, VIRTUWIND, COHERENT) held a Workshop on “Software Networks and 5G: from network programmability to SDN/NFV combination for effective network slicing”. –FLEX5GWare and mmMAGIC, with 5G-Champion, 5G-MiEdge worked on a Workshop on “Prototyping the 5th Generation Cellular Wireless Technology”. –mmMAGIC organised a Workshop on “Millimetre-wave technology for 5G access, fronthaul and backhaul”. –5G-ENSURE organised a workshop on 5G Securitywith the Security WG. –COGNET and SELFNET organised the “2nd Network Management, Quality of Service and Security for 5G Networks”. –Euro-5G gave information on phase 2 projects. This workshop presented and discussed recent research results covering the need for 5G spectrum and the suitability of the frequency bands under consideration (sub-GHz to millimetre) for 5G to provide ambitious services and adequate coverage, especially leveraging the 5G PPP projects advancements. The workshop was attended but over 80 experts. Branimir Stantchev, Head of Sector, Spectrum for Wireless Broadband at DGCONNECT,presented key issues on 5G spectrum needs from the EC point of view. Pioneer bands (700 MHz, 3.6 GHz and 26 GHz) were reiterated and highlighted the status of spectrum for verticals (sub-1 GHz, 5.9 GHz, sub-700 MHz). Dino Flore, 5GAA Director General, focused on V2X specific issues. One of the most interesting 5G use-cases is V2X, the framework that will allow vehicles to communicate with each other and beyond. 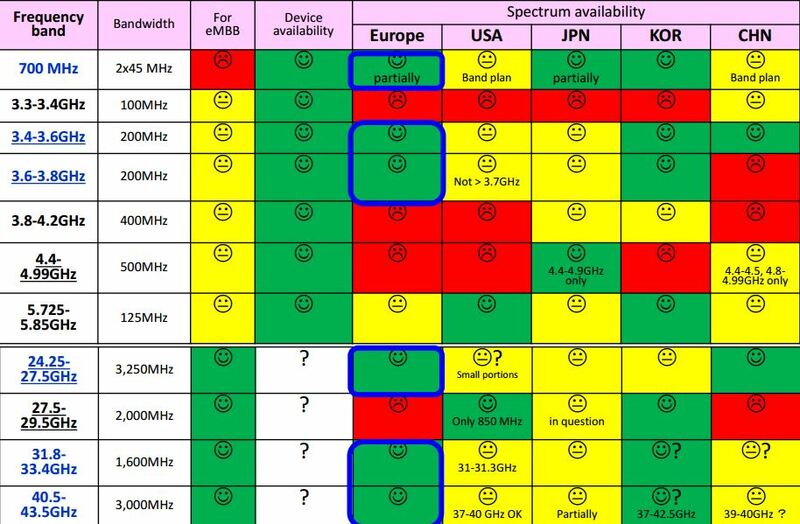 Stefan Apetrei Chair 5G Spectrum project NGMN reiterated main messages from the spectrum white paper released just after the WRC-15 (bands around 700 MHz, 3.5 GHz, 24.25-27.5 GHz, 31.8-33.4 GHz and 37-43.5 GHz, the 28 GHz for Asia and North America, the 6-24 GHz range). Du Ho Kang from METIS-II and Mythri Hunukumbure from mmMAGIC presented results of suitability studies of mmWave spectrum for 5G access networks. Mr. Barry Lewis, Director Spectrum Management and Regulations Samsung Electronics Research UK showed early deployment 5G mm-Wave in Asia. A lot of important things have been said on 5G spectrum options, 5G technological enablers, 5G use cases and scenarios. But how to make 5G successfull has less been debated. 4G/LTE has always been and is still difficult to monetise from MNOs’ points of view. Traditional criteria are still used to monetise 4G/LTE i)postpaid/prepaid, contract length; ii)terminal subsidy, iii)domestic / international, iv)data volume, v)bitrates, vi)content, vii)bundles with fixed access). New criteria have appeared: i)content discrimination: volume or bitrates differentiated by viii)usage (music, games) or ix)device (tablet, handset or wearable), x)Range of segmentation by video quality (SD/HD), xi)Fixed used of cellular access. Volume is still the main monetization criterion. Content discrimination is a new criterion. Unlimited data plans are still a hot topic with many moves addressing various purposes. Bitrate segmentation is still emerging even though a number of technical issues need to be tackled. 5G brings in new opportunities. 5G opportunities are mainly based on the disintermediation of the value chain. 5G brings in the opportunity for MNOs to capture new revenue streams (e.g. in the mMTC business). But competition could be fiercer on traditional MNO revenue streams when sharing will be required. 5G is expected to enhance current use cases and expand to new ones, disrupt current value chains and business models. The XaaS (Anything as a Service) model, and the likes (PaaS, NaaS, ScaaS, IaaS respectively for Platform as a Service, Network as a Service, Small Cell as a Service, Infrastructure as a Service) will mostly be based on cloud computing and the ability to deliver highly customised very fast services thanks to network slicing and softwarisation (SDN/NFV). In the ScaaS model, specific providers can cost-effectively, when/wherever needed and faster improve indoor or outdoor coverage when MNOs cannot alone fulfill users’ expectations.